Allow Flowers for Everyone to make an impact with beautiful flowers for the office. 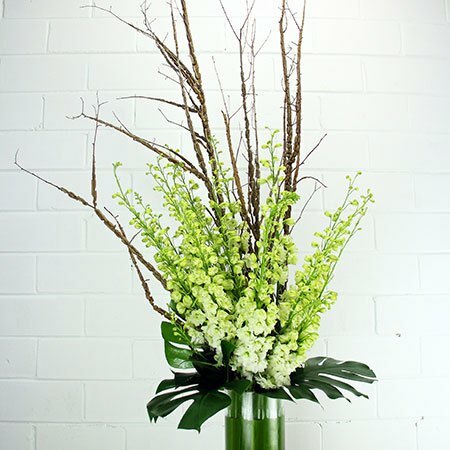 This spectacular, front-facing vase arrangement features tall sculptural sticks as a backdrop to long stemmed seasonal blooms, such as orchids, kangaroo paw, gladioli, delphinium and lilies. Framed with tropical leaves, these tall office flowers look fantastic in a commercial space with high ceilings. Colours can be customised based on your office decor - for a free consultation with our florists to discuss your corporate flowers, please give us a call on 1800 66 66 46 or email sales@flowersforeveryone.com.au. *Please note: The pictured flowers are specific to seasonal availability. Colours can be customised and a corporate flower arrangement designed around your budget requirements. Flowers for Everyone provide weekly corporate flower services to Sydney metro businesses.